The Tennis Player tea cosy is a bit of a challenge with Wimbledon 2017 championships starting on the 3rd of July – that’s just over 2 weeks away – Yikes! I was so tempted to make a Fiona Butler style tea cosy, but thought I had better keep to tennis. So my design is of a lady tennis player with a cute two bun hair do, waiting for her opponent to serve. She’s poised in a bent over position with her tennis racket ready for a back or forehand response to the serve. I have given her a sun visor to keep the sun out of her eyes and a little white tennis dress. Behind her legs, you can see the green of the tennis court. I’m also going to give her some white tennis shoes. 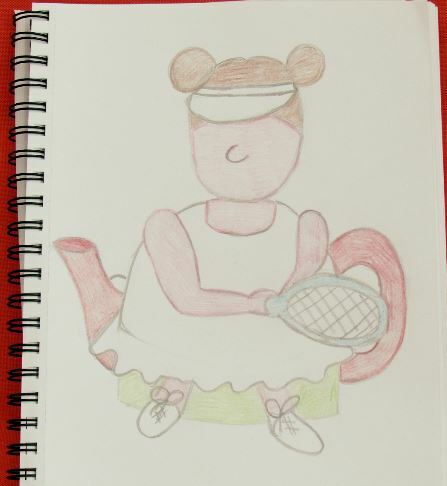 The Tennis Player tea cosy is going to be perfect for all those armchair tennis players who are avid Wimbledon fans. She will keep you company whilst keeping your tea hot. Just a thought, you could knit two; and have one at either end of the coffee table looking like they are having a game.